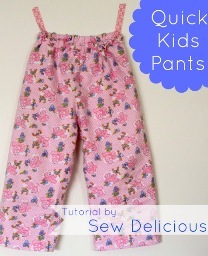 Rosslyn from Sew Delicious shares a tutorial on her blog showing how to make a pair of kid pajama pants. You’ll be using a pair of pajama pants that fit you as the cutting guide, so you don’t need a pattern. It’s easy to do and should take less than an hour from start to finish. Get the how-to.